Dr M Dinesh, MD, DNB, of Amrita Institute of Medical Sciences, Kochi launches www.makeawish.space by EzeeSolve on July 4, 2015, World Tibet Day. Amrita Institute of Medical Sciences, Kochi: On the auspicious 80th Birthday of His Holiness the XIV Dalai Lama, celebrated world over as World Tibet Day, www.makeawish.space was launched by EzeeSolve, a Software Solutions Provider. The site provides a virtual space to share 1-minute video selfies to wish a person on their special day, or to share a message or to talk about a cause which is dear to the person. www.makeawish.space was launched on July 4, 2015 by Dr M Dinesh, MD, DNB, of Amrita Institute of Medical Sciences, Kochi. The site was launched as part of the 2015 World Tibet Day celebrations coordinated by Friends of Tibet. 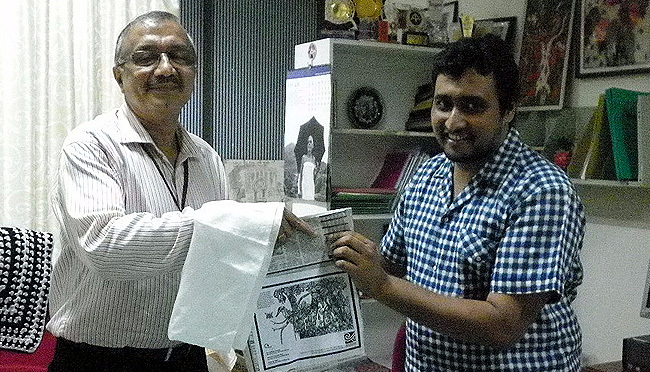 Eswar Anandan, Campaigner, Friends of Tibet presents World Tibet Day kit to Dr M Dinesh, MD, DNB, of Amrita Institute of Medical Sciences, Kochi on July 4, 2015, World Tibet Day. The virtual platform provided an opportunity for the well wishers of His Holiness the XIV Dalai Lama to wish him on his 80th birthday, some of the interesting messages included one from a 3-year old and a 5-year old well-wisher. Students of one of the oldest and well known colleges in the Ernakulam city wished him together, singing and wishing him long-life. The users can share video selfies with www.makeawish.space in any of the three ways: 1. Directly from the website. 2. Email to share@makeawish.space. 3. Send by Whatsapp to the number +91.8089965418. World Tibet Day (WTD) was first initiated in Chicago in 1997 at an informal meeting between Tendzin Choegyal, the Dalai Lama's younger brother and Richard Rosenkranz. The concept of WTD was proposed by Rosenkranz saying it could become an annual worldwide event, designed to help the Tibetan people regain their essential freedoms. He also suggested this event could be a way to showcase and celebrate the unique value of Tibetan culture and thought. Enthusiastic about the idea, Tendzin Choegyal suggested WTD should be held on July 6th, linked to his brother's birthday, in order to increase potential support among Tibetans.